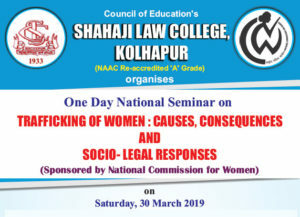 Shahaji Law College, Kolhapur is established in the year 1933. It is permanently affiliated to Shivaji University Kolhapur and included in the list of Colleges maintained under section 2(f) and 12(b) of the University Grant Commission Act, 1956. For the admission process the students are admitted to the said courses on first come first basis. The admission is governed by Shivaji University, Kolhapur. 2 Diploma in Labour Law (D.L.L.) After H.S.C.